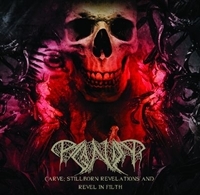 This compilation is the two releases Paganizer did when they were on hiatus and recorded under the name Carve. 'Stillborn Revelations' contains the two first Carve demo's. They were already released in 2002 by the Brazilian label Black Hole Productions. 'Revel in Human Filth' (2004) is the second Carve album on this record, also only released in Brazil. That second album was produced by Dan Swäno, and that you can hear for certain. Vic Records got the rights to release both albums world-wide so fans of Rogga Johansson have something to ask for, for Christmas. With Rogga in the band, you know what music you can expect and no matter if you name it Carve, Ribspreader or Paganizer, Swedish death metal in Entombed/Dismember style is what you get. The difference in production and sound between the two albums is big. The first tracks don't have a terrible sound, but when the first track of their second release starts ('Storm Across a Dead Planet") you hear the difference. The bands with Rogga in the line up never succeed in playing on the same high level as Entombed and Dismember, but they never disappoint either. "Imhotep" is my personal favorite of the first album and "Soulrape Unleashed" almost reaches the Entombed level. For Swedish death metal addicts, this is meat for their master.